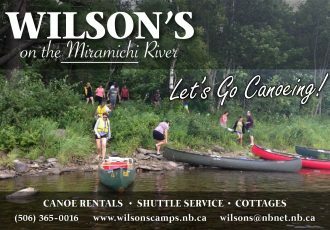 Atlantic salmon fly-fishing report for Miramichi River at McNamee for July 25th . The water is up this morning app. 3 inches and has cooled down really nice . We had good fishing last night and the boy’s saw more fish on the move . The water is very clear so if you are fishing wet it will have to be on long leaders and tiny flys , one fish was taken last night on a #12 black-bear , another fish was hooked on a large split wing bomber . If anyone has news from other rivers or locations please forward them to us .